After Subaru discontinued the wild turbo manual versions of the Legacy, there weren't many reasons to buy one. The 2015 Subaru Legacy, however, makes a compelling case for most buyers in this class: It gets 36 highway MPG even with standard all-wheel drive. 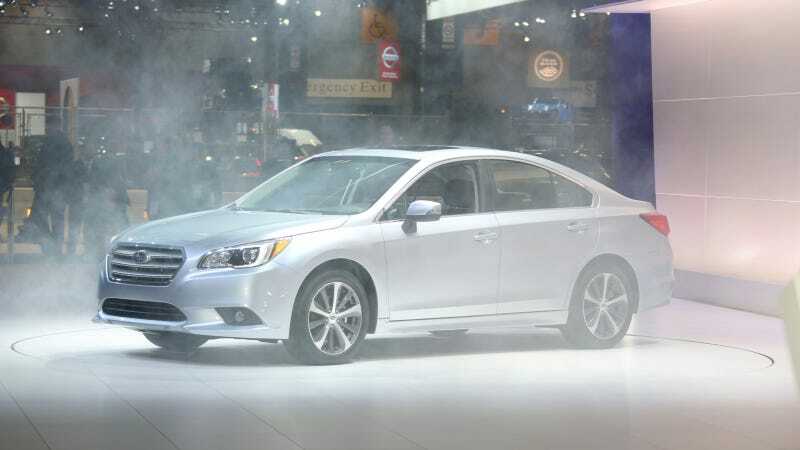 The 2015 Legacy is expected to get fuel economy ratings of 26/36 with its 2.5-liter four. That's better than the 2015 Chrysler 200 2.4, or the 2014 VW Passat with its new 1.8-liter turbo four. It's as good as the Honda Accord with its CVT. And none of those cars have a four-cylinder, AWD version. In fact, it's almost as good as the 27/36 rating on the smaller Subaru Impreza. The 2015 Legacy keeps its four and six-cylinder boxer engines, making 175 and 256 horses, respectively. They all get CVTs now, as the six ditches its old five-speed automatic. There's still no manual or turbo four, though, so go complain to Subaru about that. But the new car does get active torque vectoring, which is a nice surprise. We already knew the 2015 Legacy would look better than the boxy model it replaces. Yes, it looks like every other entry in this segment, but it isn't ugly. Inside, however, the Legacy has taken a big step up, bringing Subaru's interiors a little further into the 21st century. But the brand's fans will probably still feel right at home. Subaru is promoting the safety aspect of the Legacy hard by making a backup camera standard and expanding availability of its EyeSight system for auto-braking and lane-keep assists. Blind spot monitoring and rear cross-path alert are also new options. Look for the new Legacy at dealerships in the summer.